Helios' Boeing 737-300 5B-DBY underwent maintenance on the night prior to the accident. The pressurization system was checked, but after completion of the tests the Pressurization Mode Selector (PMS) was reportedly left in the "Manual" position instead of the "Auto" mode. In manual mode the crew had to manually open or close the outflow valves in order to control the cabin pressure. The outflow valves were one-third in the open position which meant that the cabin would not pressurize after takeoff. The PMS mode was apparently not noted during the pre-departure checks by the crew. In the morning the 737 was to operate Flight 522 from Larnaca to Prague, Czech Republic with an intermediate stop at Athens, Greece. The flight departed Larnaca at 09:07 for the leg to Athens with a planned flying time of 1 hour and 23 minutes. As the airplane climbed over the Mediterranean the cabin altitude alert horn sounded. This occurred as the 737 passed through an altitude of 10,000 feet. Cabin altitude is usually held around 8,000 feet. The crew possibly thought it was an erroneous takeoff configuration warning because the sound is identical. Then, at 14,000 feet, the oxygen masks automatically deployed and a master caution light illuminated in the cockpit. Because of a lack of cooling air another alarm activated, indicating a temperature warning for the avionics bay. The German captain and the Cypriot co-pilot tried to solve the problem but encountered some problems communicating with each other. They contacted the Helios´ maintenance base to seek advice. The engineer told that they needed to pull the circuit breaker to turn off the alarm. The radio contact ended as the aircraft climbed through 28 900 ft. The circuit breaker was located in a cabinet behind the captain. The captain got up from his seat to look for the circuit breaker. The crew were not wearing their oxygen masks as their mindset and actions were determined by the preconception that the problems were not related to the lack of cabin pressure. As the airplane was still climbing the lack of oxygen seriously impaired the flight crew. The captain probably became unconscious when he was trying to find the circuit breaker. The first officer was still in his seat when he also became unconscious. Because the plane's autopilot was programmed for FL340 the Boeing continued to climb until leveling out at that altitude some 19 minutes after takeoff. At 09:37 the 737 entered the Athens FIR but not contact was established with the flight. Over Rodos at about 09:52 the airplane entered the UL995 airway. At 10:21 the airplane passed the KEA VOR, which is located about 28 nm south of the Athens airport. The airplane then passed the Athens Airport and subsequently entered the KEA VOR holding pattern at 10:38. All efforts by Greek air traffic controllers to contact the pilots were futile. Around 11:00 two Greek F-16 fighter planes were scrambled from the Néa Anghialos air base. At 11:24, during the sixth holding pattern, the F-16's intercepted the airliner. The F-16 pilots reported that they were not able to observe the captain, while the first officer seemed to be unconscious and slumped over the controls. At 11:49, the F-16's reported a person not wearing an oxygen mask entering the cockpit and occupying the captain's seat. The F-16 pilot tried to attract his attention without success. At 11:50, the left engine flamed out due to fuel depletion and the aircraft started descending. At 11:54, two Mayday messages were recorded on the CVR. At 12:00, the right engine also flamed out at an altitude of approximately 7100 feet. The aircraft continued descending rapidly and impacted hilly terrain. The same Boeing 737, 5B-DBY, suffered a loss of cabin pressure on December 20, 2004 during a flight from Warsaw to Larnaca. Three passengers needed medical treatment after landing in Larnaca. This incident was caused by a leaking door seal of the right hand rear door. indication, Master Caution), and continuation of the climb. the fuel and engine flameout, and impact of the aircraft with the ground. 1. The Operator’s deficiencies in organization, quality management and safety culture, documented diachronically as findings in numerous audits. supervision and its inadequate responses to findings of deficiencies documented in numerous audits. 3. Inadequate application of Crew Resource Management (CRM) principles by the flight crew. both with regard to modifications to aircraft systems as well as to guidance to the crews. 1. Omission of returning the pressurization mode selector to AUTO after un-scheduled maintenance on the aircraft. masks deployment, and continuation of the aircraft ascent (climb). 3. Ineffectiveness of international aviation authorities to enforce implementation of corrective action plans after relevant audits. On 25 August 2005, the AAIASB recommended to the NTSB that the Boeing Company consider taking action to emphasize flight crew training and awareness in relation to (a) the importance of verifying the bleed and pack system configuration after takeoff and (b) the understanding and recognition of the differences between cabin altitude and takeoff configuration warnings. On 25 August 2005, the AAIASB recommended to the NTSB that the Boeing Company clarify the Aircraft Maintenance Manual (AMM) maintenance procedure for Cabin Pressure Leakage Test (05-51-91) to explicitly specify the actions necessary to complete the maintenance test. Currently, under the title of section F “Put the airplane back to its initial condition”, there were three action items but none of them referred for the pressure mode selector to be placed in the position AUTO. On 13 September 2005, the AAIASB recommended to the NTSB that the Boeing Company consider revising the Aircraft Maintenance Manual (AMM) 05-51-91 by adding an additional step associated with section F (“Put the airplane back to its initial condition”): to re-install the oxygen mask regulators (if removed) per AMM 35-12-00. 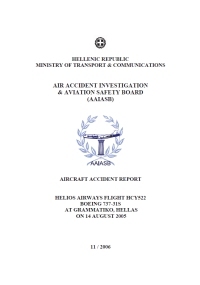 On 20 October 2005, the AAIASB recommended to the Cyprus Air Accident and Incident Investigation Board that all airlines under the jurisdiction of the Cyprus DCA standardize cabin crew procedures for access to the flight deck and use of the cockpit door, and include relevant training in the Operations Manual. On 23 December 2005, the AAIASB recommended to the NTSB that the Boeing Company consider enhancing the design of the Preflight checklist to better distinguish between items referring to the air conditioning and the pressurization systems of the aircraft and to include an explicit line item instructing flight crews to set the pressurization mode selector to AUTO. On 23 December 2005, the AAIASB recommended to the NTSB that the Boeing Company reconsider the design of the Cabin Pressure Control System controls and indicators so as to better attract and retain the flight crew’s attention when the pressurization mode selector position is in the MAN (manual) position. On 2 May 2006, the AAIASB recommended to the Hellenic ACC that it consider the need for adding an indication on the label attached to the target of a flight on the radar scope, to draw a controller’s attention when radio communication has not been achieved, and that it establish procedures to specify a time limit within which a controller should take the initiative to contact a flight that omitted to report its position when it crossed a compulsory reporting point (FIR boundaries, etc.). ICAO procedures (Doc 4444) stated that action should be taken if a report from an aircraft is not received within a “reasonable period of time”, and it is left to regional air navigation agreements to prescribe a specified time interval. AFM update, adding \'\'For normal operations, the pressurization mode selector should be in AUTO prior to takeoff"
EASA/JAA require all airlines to amend cabin crew procedures, so that, when the oxygen masks deploy in the cabin due to loss of cabin pressure or insufficient cabin pressure and if the aircraft does not suspend climb, or level-off or start a descent,, the Cabin Chief (or the cabin crew member situated closest to the flight deck) be required to immediately notify the flight crew of the oxygen masks deployment and to confirm that the flight crew have donned their oxygen masks. EASA/JAA require aircraft manufacturers to install in newly manufactured aircraft, and on a retrofit basis in older aircraft, in addition to the existing cabin altitude warning horn, a visual and/or an oral alert warning when the cabin altitude exceeds 10 000 ft.
EASA/JAA require practical hypoxia training as a mandatory part of flight crew and cabin crew training. This training should include the use of recently developed hypoxia training tools that reduce the amount of oxygen a trainee receives while wearing a mask and performing tasks. EASA/JAA and ICAO require aircraft manufacturers to evaluate the feasibility of installation of a CVR that records the entire flight. EASA/JAA and ICAO require all company communications with the aircraft (operations office, technical base/stations, and airport stations) to be recorded. EASA/JAA and ICAO require the aircraft manufacturers to also record cabin altitude on the FDR. EASA/JAA and ICAO study the feasibility of requiring the installation of crash protected image recorders on the flight deck of commercial aircraft. EASA/JAA and ICAO implement a means to record international safety audits of the States’ Civil Aviation Authorities, which ensures that the findings can be tracked in depth, action plans are developed and implemented in shortest possible time; and impose the necessary pressure when they become aware that international obligations and standards are not being met by the Authorities. The Republic of Cyprus should support by all necessary resources the already under-reorganization Cyprus DCA so that it may be better equipped to carry out the governmental aviation safety oversight functions and to meet its international obligations in the shortest possible time. Distance from Larnaca Airport to Athens-Elefthérios Venizélos International Airport as the crow flies is 924 km (578 miles).